For me, the Bare-Tool Milwaukee 2645-20 18-Volt M18 Jig Saw is pretty much the perfect model. I opted for this particular one as I quickly grew tired of the $20 supermarket jigsaw varieties. I needed something with a bit more heft to it, not just a flimsy, easy to throw in the air tool. I do realize that this might be just my personal preference and that this model might not be the perfect one for some people. However, I took some moments to make this review and guide to at least give you more information on what I thing a perfect jigsaw should be, look and feel like. Upon realizing this, and in order to assist buyers like myself in choosing the right tool for the job, I came up with this buyer's guide. I felt that there was a need for concise information that would help an average guy make the right buying decision (pro tip: you can find the best prices online) when it comes to power tools such as the circular saw. So without further ado, let's go ahead and discuss what this product is all about so that you may get familiar with it, and hopefully empower you to make that buying decision. A jigsaw is, arguably, the only tool that, once you get used to, you will not want to substitute. This is what I believed – and still do – when I tried to scour the web in search of a few models to compare. Now, I say a few because I have very specific requirements in mind. I know that the market is full, overflowed in my opinion, with a large pallet of such power tools. Some are pretty good both quality and budget wise, some are mostly a long term investment, and then there are those that are not worth anyone’s while. The last category I am very familiar with as I too was drawn by the extremely low prices of some flimsy jigsaws. While they are ideal for occasional users (making a tree house at one point doesn’t turn you into a professional), they will not last a day in a real-life workshop. The Bare-Tool Milwaukee 2645-20 18-Volt M18 Jig Saw caught my eye mainly because it wasn’t lightweight. Trust me…the difference is significant. Its 8 pounds do provide a better control and stability when compared to lighter models. The cuts are also pretty accurate, though I do wish it had some sort of incorporated LED light for a better visibility if the said cuts. I mean…they put LED’s on anything now!!! I do recommend the Bare-Tool Milwaukee 2645-20 18-Volt M18 Jig Saw mainly to professional contractors as they will know what I am talking about in terms of heft. They will appreciate the solid feel in the hands and the better control and stability. Occasional users and DYI aficionados are also welcome to try this, but they should know what to expect. This is not a flimsy piece of equipment. The jigsaw is probably one of the most versatile types of power tools. They can make both curved and straight cuts, no matter the material you use, be it wood, plastic or a ceramic tile. Which one is better? The catch here is the blade. Sure, the unit provides the power and it should be a high-quality one, but the blade will make the difference. In this case, wider blades are ideal for straight, long cuts, while smaller, narrow blades will be great at cutting curves. Depending on the finish you want to have, opt for either a blade with few, large teeth (it cuts really fast and leaves a rough finish) or one with lots of small teeth (it cuts slow, leaving a smooth surface). Here, you will have fewer products to choose from. The teeth are extremely small and sharp (21-24 teeth/inch). The best way to orient yourself is to place the blade on top of the metal sheet – at least 3 teeth have to touch the sheet. If this is not the case…keep looking! This particular case requires a reverse-tooth blade with downward-facing teeth. The cuts will be both smooth and clean. ​Opt for a circle-cutting jigsaw. This one will have a beam (long and flat arm) attached to the unit as well as an adjustable pivot representing the circle’s center. The most important part of the saw selection process is its durability. Whatever saw you pick, it must be durable enough to withstand the ruggedness of normal use. During selection, try to ask the hardware attendant if there is any possibility that you could do a durability test on the saw. Feel the saw in your hand. Try to drop it from knee height and see if it comes apart right away. Saws need to be tough since they are construction tools after all. See if the blade assembly is stable during operation and will not fall apart during operation. The high-quality of the Bare-Tool Milwaukee 2645-20 18-Volt M18 Jig Saw will have it last for a very long time. This is also the first lithium-ion operated jig saw. Pretty great, actually. The unit’s shoe bevel, tool-free, equipped with positive stops will allow you to adjust the shoe quickly and with an increased level of accuracy. The bevel goes 45 degrees both to the left and to the right and has detents at 0, 15, 30 and 45 degrees. This model’s orbital setting, 5-positions, will offer more versatility in cutting when compared to that of other models in its class. Any user, no matter the level of experience, will be able to easily select the exact type of cut or speed that a particular job requires. The quick-lok blade clamp allows for fast and easy blade change. What is probably the best feature is its heft. The weight (about 8 pounds) is equally distributed in an almost perfect manner. It does feel very solid in the hand, and connoisseurs will immediately notice that there isn’t any blade related bounce. This shoe bevel with positive stops will ensure that anyone can make accurate shoe adjustments. This feature will allow for a maximum bevel at 45 degrees in both directions, left and right, with detents at 0, 15, 30 and 45 degrees. 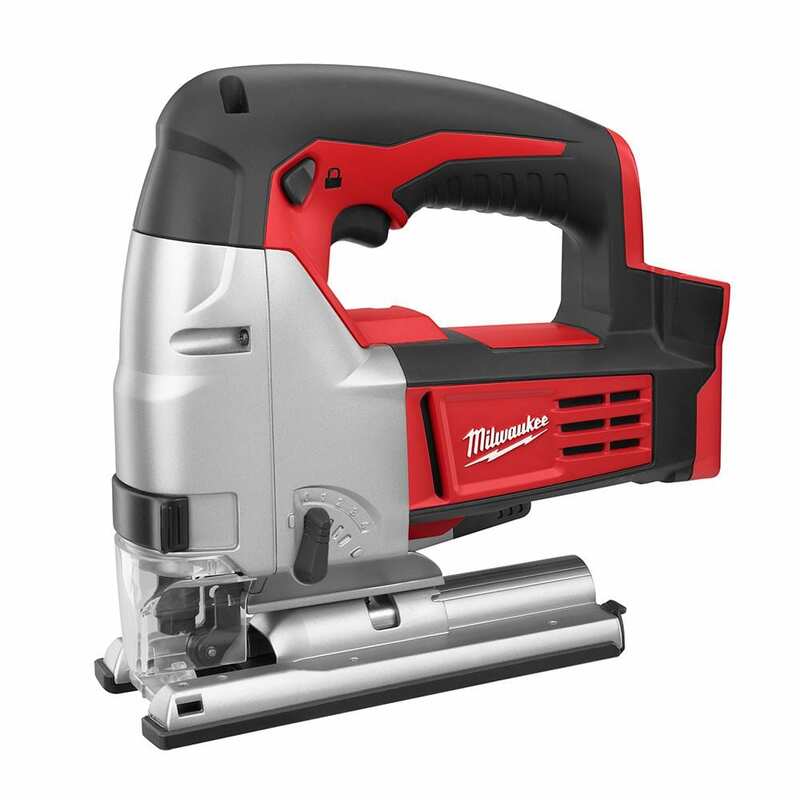 The Milwaukee 2645 is equipped with a 5-position orbital cutting that will increase the level of versatility. This allows the jigsaw unit to make application specific cuts, more so than any other model on the market. This feature will help in protecting the work surface against any potential damage. This other feature of the Milwaukee 2645 provides an optimal level of control in cutting a large variety of materials. Though I was a bit enamored with the Milwaukee model I still decided that it’s better to be safe than sorry. That being said, I started reading every single piece of information and review that I could get my hand on – metaphorically, of course, as I used the web. There were quite a few reviews on this unit, as I was expecting, some great, some bad and some just in between. I was put a bit at ease when I saw that most previous users – those who took the time to comment at least – were quite pleased with the jigsaw and gave it five stars. On the downside, there were some buyers that had taken an issue with the blades not being straight. I later found out from another comment that the blades need a little more strength to fix them correctly in place. This is more of a human miss than a machine quality one. This model from Dewalt is a pretty versatile unit that will allow you to make a large variety of cuts in all sorts of materials. Like my top choice, this one is also battery-operated and needs a voltage of 20V. The lever-action keyless blade, all-metal, will allow for a quick and easy blade change. Also, the all-metal keyless shoe bevel with detents at 0, 15, 30 and 45 degrees, will provide an increased versatility for an easier bevel cutting. Most people find this unit a great addition to their wide palette of cordless tools. It is quite powerful, and has a variable speed of 0 – 3,000 SPM. This jigsaw from Makita comes equipped with a brushless motor and a variable speed control dial (6 speeds), going from 800 to 3,500 SPM. This ensures you can easily match the speed to any application. Thanks to the 3 orbital settings and straight cutting option, it does deliver more accurate cuts in a wide range of materials. The very efficient BL Brushless motor is easily controlled electronically, optimizing battery energy use for up to a 50% longer run time per charge. The elimination of carbon brushes allows the motor to run longer, cooler and more efficient. With so many perks, this unit is also a great option to have in mind. Probably a good surprise for many people is the fact that this model from Bosch is actually pretty lightweight, 30% more than its peers in the same class. Also compact (10% smaller than other models on the market), this jigsaw is still a very powerful one. It comes with a one-handed insertion/ ejection feature for a plus of convenience and ease of use. The dust blower is always on for an increased visibility of cuts and the small grip diameter will reduce fatigue, also a nice perk to have. Last, but not least, we have the Porter Cable PCC650B unit. Equipped with 3 orbital settings and a variable speed trigger, ranging from 0 to 2,500 SPM, this jigsaw seems like an ideal choice for many users. The blade is released tool-free, also a nice perk to have and the dust blower is quite efficient at clearing debris and improving visibility. I find the Bare-Tool Milwaukee 2645-20 18-Volt M18 Jig Saw pretty easy to use and I mainly appreciate its sturdy build, almost tank-like. Yes, this model I bought was just a bare-tool one so I had to buy the lithium-ion batteries and everything else I needed. However, I should respond to those criticizing this aspect, - you can actually buy the entire enchilada for a larger price. If you already have everything you need, I do think this unit is a great bargain. Performance wise, the 2645 model didn’t disappoint. It is hefty, high-quality and very well built. The first impression I got was that it could probably be thrown off a skyscraper and still survive. All in all, even though I haven’t used this tool for more than 3 months, I have to say that up until now I don’t regret the purchase. If you find this review useful and are deciding to purchase it, I do suggest to find and compare online for the best prices.